BeFree Sound 5.1 Channel Surround Sound Bluetooth Speaker System- Blue. Complete your home theater experience with stunning sound from this 5.1 channel Bluetooth speaker system. Connect a TV, DVD player, video game system, MP3 player, or computer and enjoy virtual surround sound. The beFree Sound home theater speaker system includes a high power amplifier and 5 surround speakers. Each speaker made has a stylish design that works well with any home entertainment system. Digital volume and bass control knobs are on the front. System is compatible with USB and SD inputs. 5.25" Amplifier x1 + 3" Speakers x5 1 SDMMC Card Slot 1 USB port Output Power: 50W+15W5 Frequency Response: 40Hz-20KHz Separation: 50dB S/N Ratio:75dB USB, SD Compatible FM Radio Bluetooth Remote Control Included (Remote requires 2 AAA batteries, not included) AC 120V Speakers are connected by wire. _gsrx_vers_783 GS 7.0.5 (783). The item "BeFREE 5.1 CHANNEL HOME THEATER SURROUND SOUND SPEAKER SYSTEM with BLUETOOTH NEW" is in sale since Wednesday, August 10, 2016. 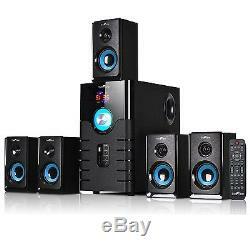 This item is in the category "Consumer Electronics\TV, Video & Home Audio\Home Audio\Home Theater Systems". The seller is "etronicspro" and is located in Los Angeles, California. This item can be shipped to United States, Canada, United Kingdom, Denmark, Romania, Slovakia, Bulgaria, Czech republic, Finland, Hungary, Latvia, Lithuania, Malta, Estonia, Australia, Greece, Portugal, Cyprus, Slovenia, Japan, China, Sweden, South Korea, Indonesia, Taiwan, South africa, Thailand, Belgium, France, Hong Kong, Ireland, Netherlands, Poland, Spain, Italy, Germany, Austria, Bahamas, Israel, Mexico, New Zealand, Philippines, Singapore, Switzerland, Norway, Croatia, Brazil, Chile, Colombia, Antigua and barbuda, Aruba, Belize, Dominica, Grenada, Saint kitts and nevis, Saint lucia, Montserrat, Turks and caicos islands, Barbados, Bangladesh, Brunei darussalam, Bolivia, Ecuador, Egypt, French guiana, Jordan, Cambodia, Cayman islands, Sri lanka, Luxembourg, Monaco, Maldives, Nicaragua, Oman, Peru, Pakistan, Paraguay, Reunion, Viet nam, Uruguay.